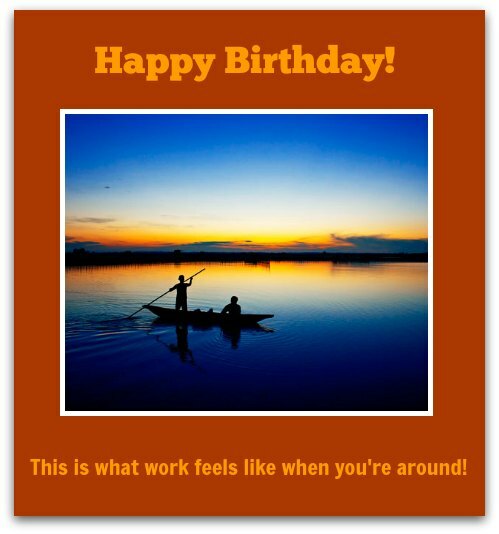 Finding perfect colleague birthday wishes may seem impossible but it doesn't have to be. You'll find just the right birthday messages for coworkers on this page. Your mission here is to find birthday greetings for colleagues that capture the qualities you like about yours. So dig deep and take a good look at your coworker to find what you like most about him or her. There are many birthday wish options to choose from below, so you can get started right now. If I won the lottery, I wouldn't work another day of my life. Because this will never happen, I'm glad I get to work with the likes of you. It's a real delight. Happy birthday! I'm very fortunate to have a wonderfully dedicated co-worker like you on my team. Happy birthday! Happy birthday. May you have little to do and lots to celebrate on your special day! Somebody up there must really like our team, because he or she give us you. You are one of the best colleagues I've ever worked with. Have a great birthday! Happy birthday to my favorite colleague. I'd cover for you anytime. You can count on me. You only have to ask and I'll be there for you (just not now — it's your birthday party and birthday cake sounds perfect right now). I guess I'm lucky because I get to work with someone like you every day. It makes my workday less like work and more like a shared goal to be the best. May your birthday be everything you want it to be and much more! On behalf of everyone in the office, we think that you're an amazing colleague. May your special day be as amazing as you. Happy birthday! For me, one of the best fringe benefits on the job is working with you. You make the time between breaks go so fast. That's a real gift. Happy birthday! Happy birthday! May your special day be filled with smiles, lots of laughter, good vibes and sweet things like birthday cake (and lots of it)! Now stop reading this message and get right back to work. Need to choose from more? I hope you won't be disappointed. Instead of a huge raise, a big promotion and a snazzy company car for your birthday, everybody at the office chipped in to get you your favorite birthday cake and contributed to this birthday message. Happy birthday! I was going to take my day off today but I changed my mind. Why? Because it's your birthday and I wanted to wish a big "happy birthday" to you (and get a big piece of birthday cake). Happy birthday! In the office, I can't think of anybody else who can make lunchtime so appetizing, especially when there's birthday cake to eat on your special day. Happy birthday! Everyone is delighted that it’s your birthday today. Working with you is such an honor because you’re a true role model for the rest of us. Happy birthday! In the beginning, we were just co-workers. Now we’re friends. I even consider you my favorite lunch buddy. Happy birthday! Today is a special day — it’s your birthday, after all. To me, you’re a buddy and a real professional. Wishing you the best of days with family and friends. Happy birthday! As you search for the perfect birthday verse, keep in mind that there are a few ways you can go with coworker birthday wishes, but there's only one thing you need to accomplish with them: you need to make your colleague feel special. This means that insincere compliments will not get the job done. What will work is what always works: genuine praise. You’re the same person, whether you’re at work or not. You’re funny, smart and incredibly friendly. A consummate professional. Happy birthday! Working with you has always been a wonderful experience. Happy birthday! Sharing my work days with you gives me all the inspiration I need to be a better worker...and a better person. Happy birthday!